Ariana Grande is back at it again ladies and gents! This time, she’s counting down to her latest single, “7 Rings,” which will be released on January 18. She has us wrapped around her finger again! The moment she even so much as hints at new music, we all jump to attention. That’s exactly what happened when Grande dropped a teaser for her soon-to-be-released single “7 Rings” the internet declined into unrestrained excitement. Ari fans are already speculating about what this new track might be about. Could it be another love song? Given how Ariana is prone to spilling the tea about her own life. Those of you who guessed and had an inkling that ex beau, ex fiancé SNL star Pete Davidson might have something to do with the song, you might have guessed it right. Yes! it was a splurge moment apparently! Hmm do you believe this or nah? could there be an underlining ,meaning that she is not confessing? For context, this sounds like after she and Davidson broke up, but before but before he sent troubling social media messages and deleted his Instagram. So, chances are, Ariana is talking about a time that she was grieving the end of the relationship and processing the drama. Push all the drama to the side Ari has been dropping fire clues, with art work and cryptic captions and videos. Grande tweeted the 14-second video alongside a caption in Japanese and English. 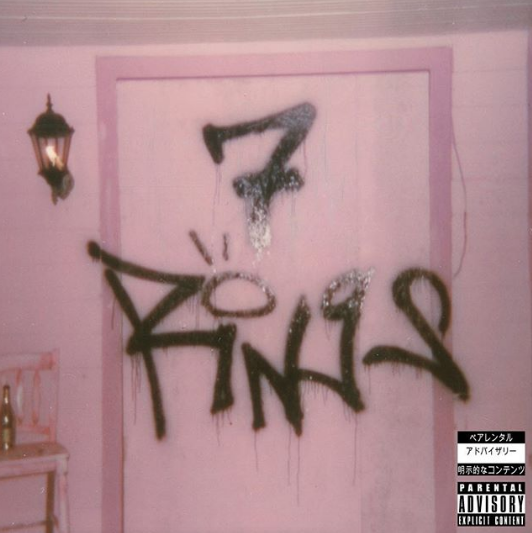 “七つの指輪「7 Rings」♡ 金曜日 friday,” wrote Grande. The tweet translates as “7 Rings. Friday,” in Japanese. Two seconds into the video, the Japanese character for 7 — 七 — is flipped around so it’s back to front. Just as Sweetener’s aesthetic was upside down, Grande’s next album vibe could well be back-to-front. The Japanese characters used in the tweet had some fans wondering whether she’s releasing a Japanese version of “7 Rings.” Ok, maybe a little too ambitious. With that being said, the track drops in 2 DAYS, on Friday Jan 18!